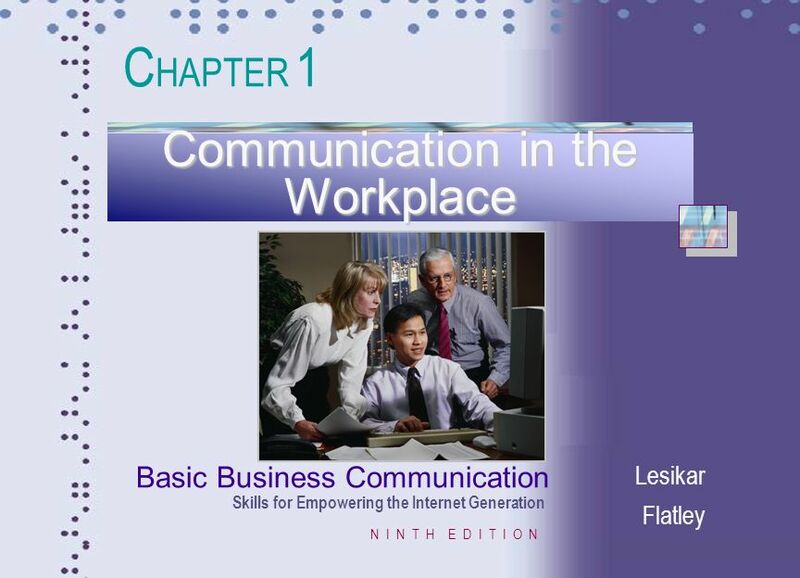 CHAPTER 1 Communication in the Workplace Use this slide to introduce the chapter. 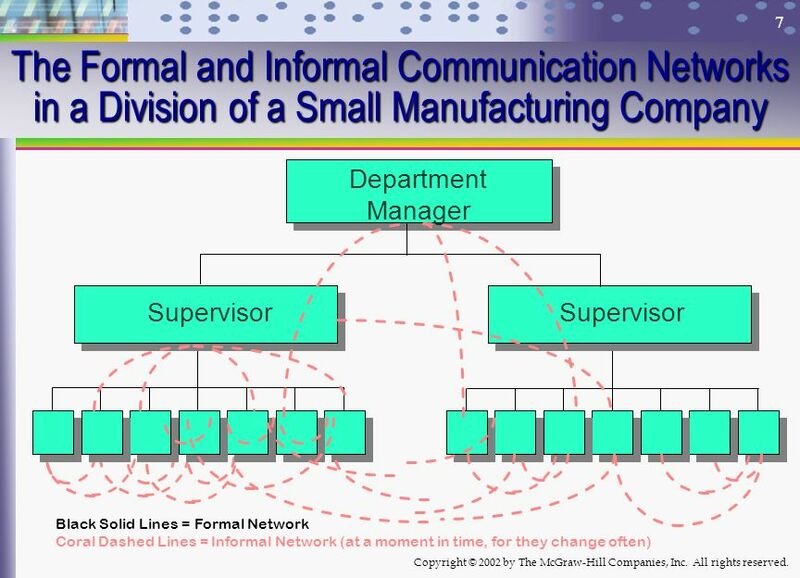 The photo also provides an opportunity to discuss formal and informal communication in the workplace. 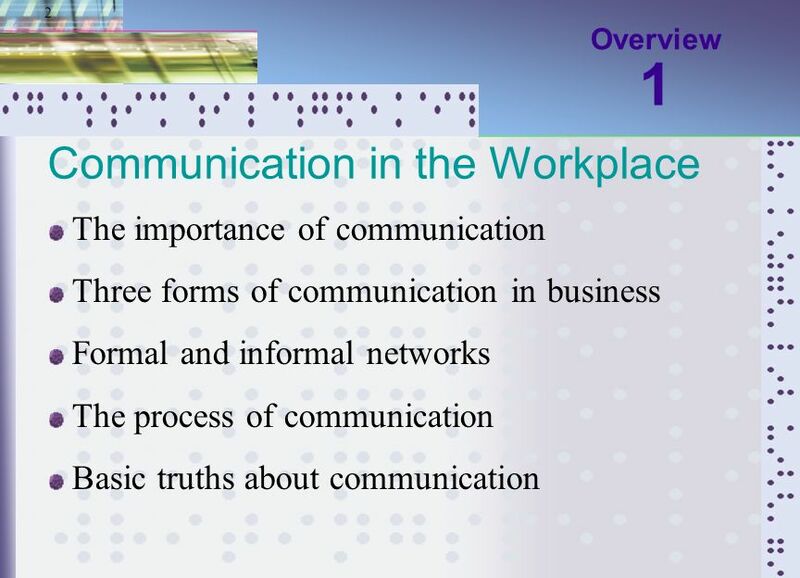 Overview 1 Communication in the Workplace The importance of communication Three forms of communication in business Formal and informal networks The process of communication Basic truths about communication Use this overview slide to introduce your presentation of this chapter. 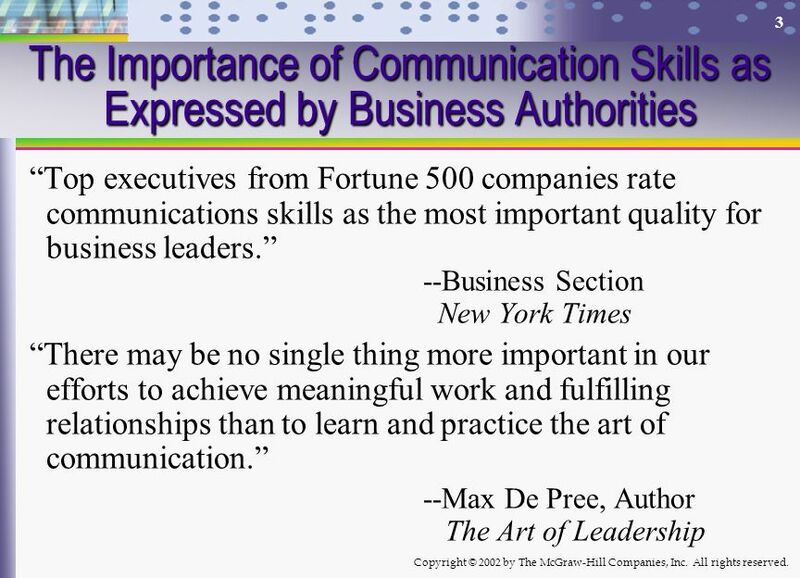 “Top executives from Fortune 500 companies rate communications skills as the most important quality for business leaders.” Business Section New York Times “There may be no single thing more important in our efforts to achieve meaningful work and fulfilling relationships than to learn and practice the art of communication.” --Max De Pree, Author The Art of Leadership Use the slide to support the value of the course. 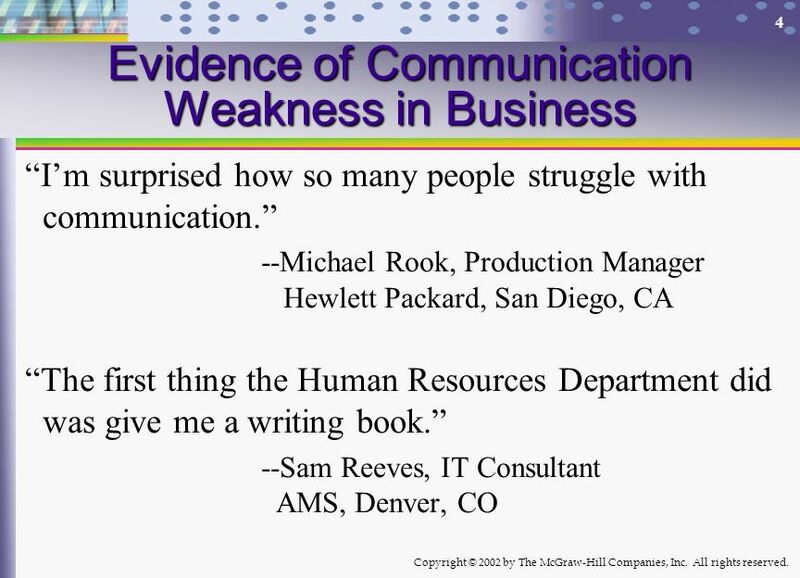 “I’m surprised how so many people struggle with communication.” --Michael Rook, Production Manager Hewlett Packard, San Diego, CA “The first thing the Human Resources Department did was give me a writing book.” --Sam Reeves, IT Consultant AMS, Denver, CO Similarly, you can use this slide to show communication weaknesses in business. Operational Internal External Personal This outlined above forms of communication in business emphasizes your lecture points. 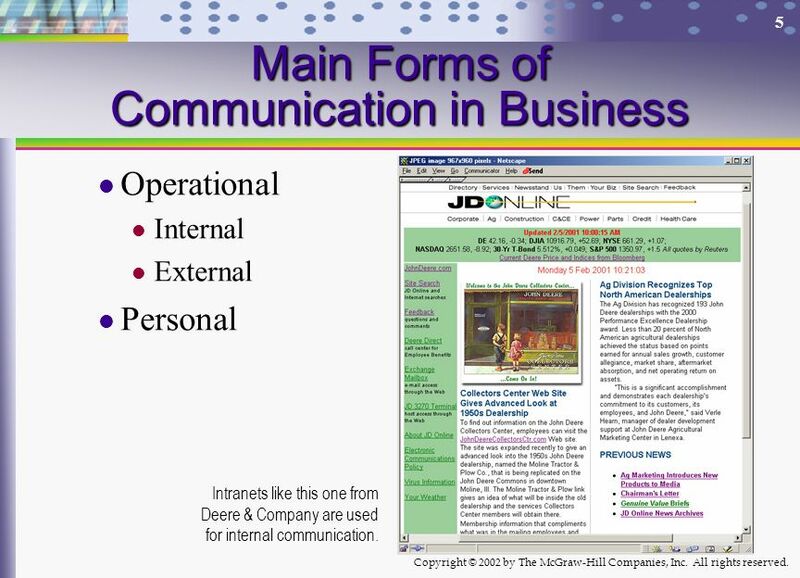 The screenshot of the intranet at Deere & Co. provides a talking point for operational communication. Intranets like this one from Deere & Company are used for internal communication. 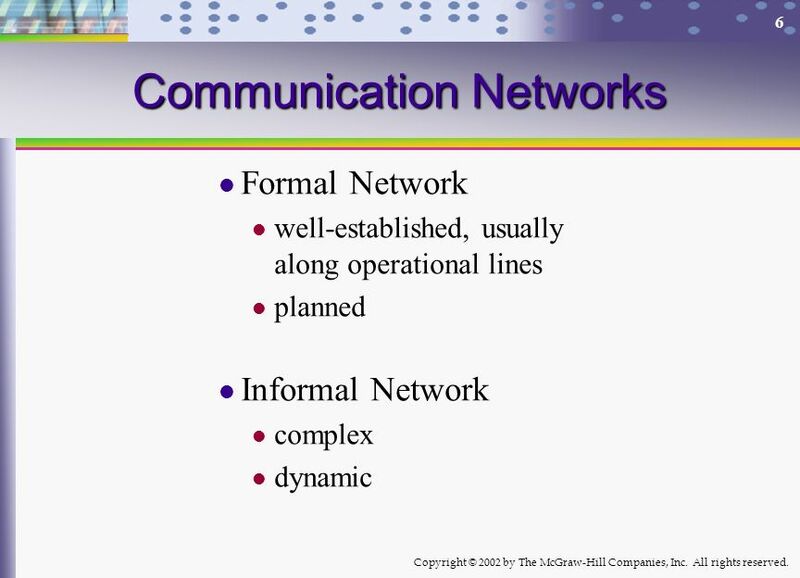 Formal Network well-established, usually along operational lines planned Informal Network complex dynamic This outline emphasizes the points in your review of networks. 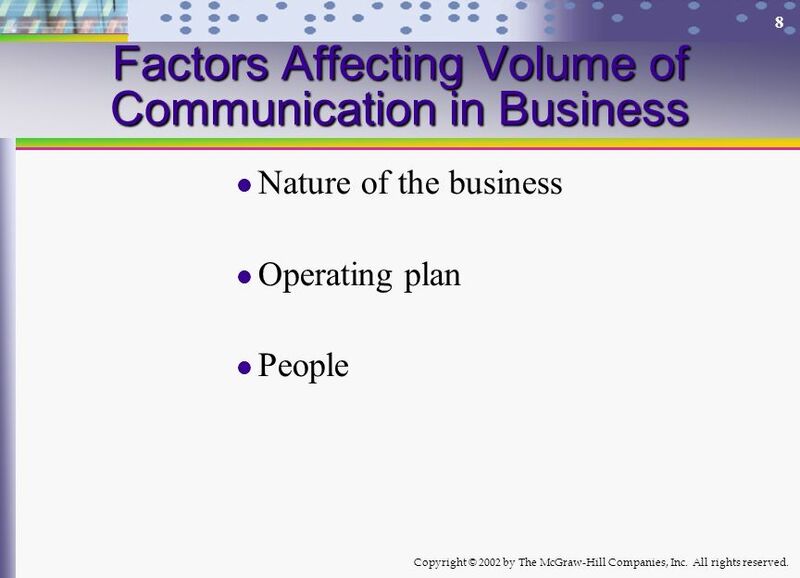 Nature of the business Operating plan People You can use this outline segment to emphasize the factors affecting how much communication goes on in an organization. 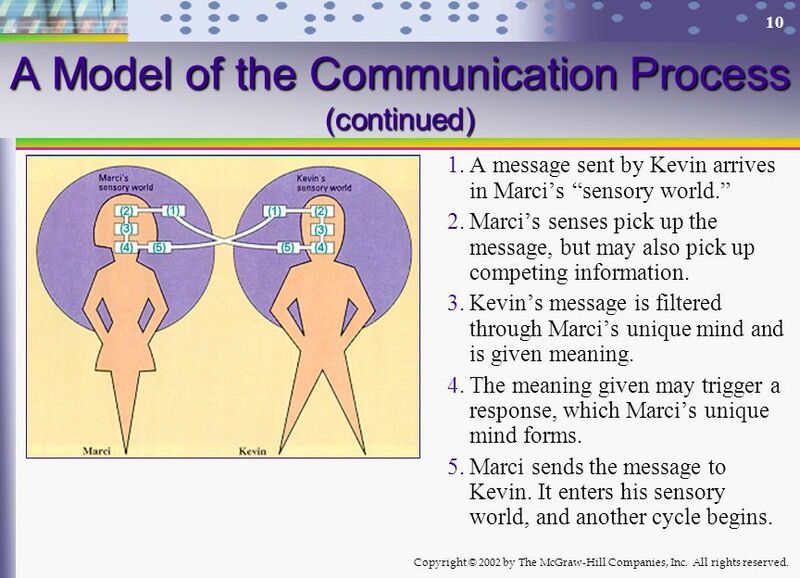 A message sent by Marci arrives in Kevin’s “sensory world.” Kevin’s senses pick up the message, but may also pick up competing information. Marci’s message is filtered through Kevin’s unique mind and is given meaning. The meaning given may trigger a response, which Kevin’s unique mind forms. Kevin sends the message to Marci. It enters her sensory world, and a second cycle begins. This model guides your discussion of the communication process, the first cycle. 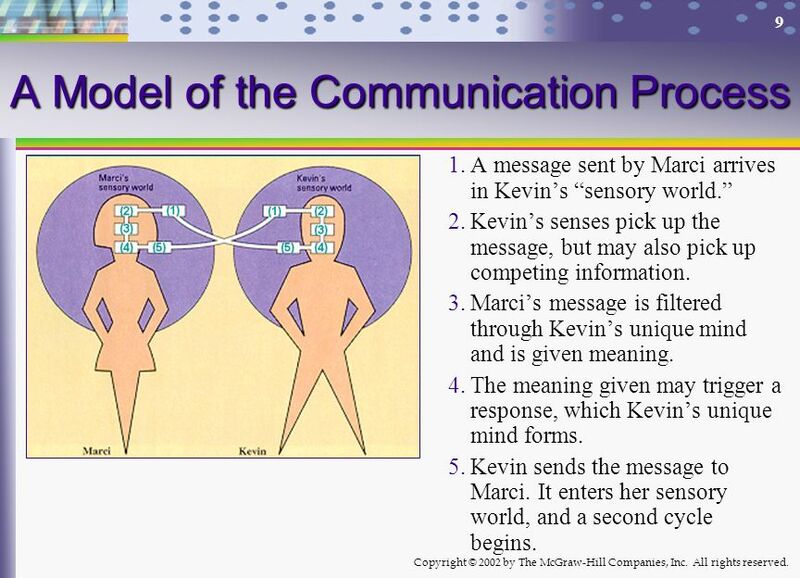 A message sent by Kevin arrives in Marci’s “sensory world.” Marci’s senses pick up the message, but may also pick up competing information. Kevin’s message is filtered through Marci’s unique mind and is given meaning. The meaning given may trigger a response, which Marci’s unique mind forms. Marci sends the message to Kevin. It enters his sensory world, and another cycle begins. This model guides your discussion of the communication process, the second cycle. is more likely to involve creative effort, has longer cycles, and usually has fewer cycles. 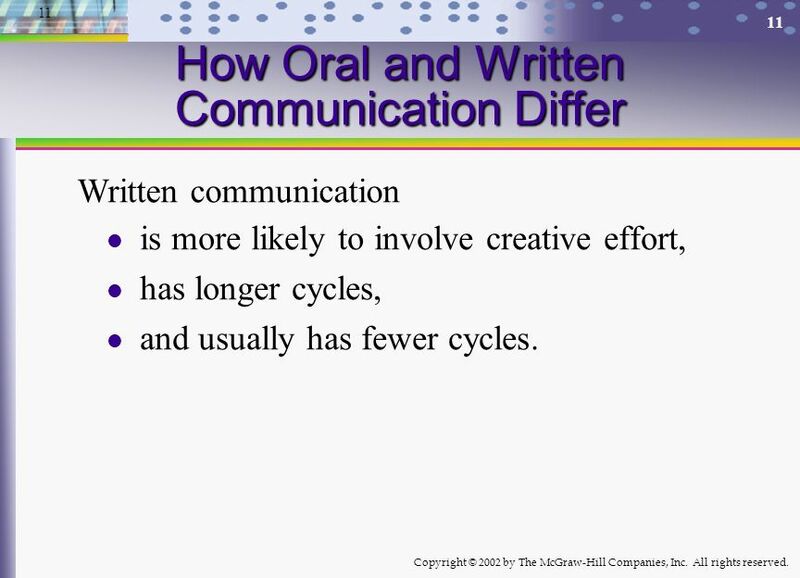 The slide summarizes how oral and written communication differ. Meanings sent are not always received. Meaning is in the mind. 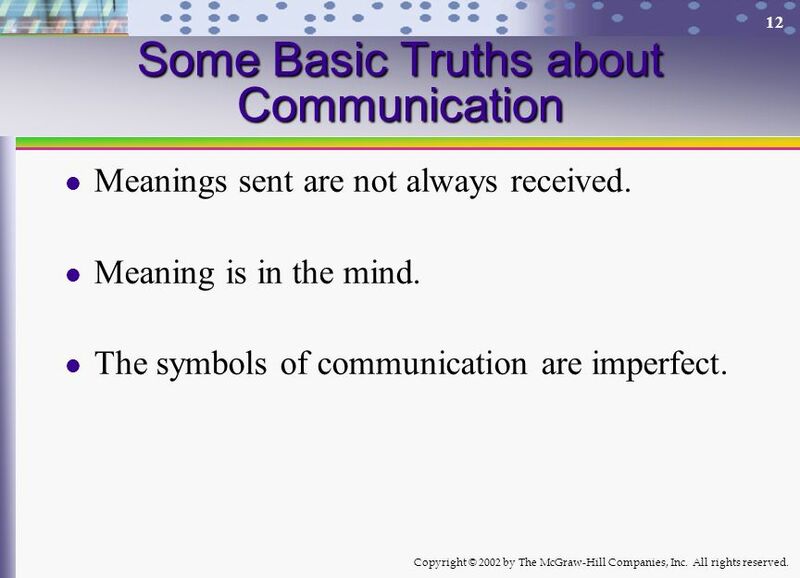 The symbols of communication are imperfect. Use this outline segment to emphasize the basic truths of communication. 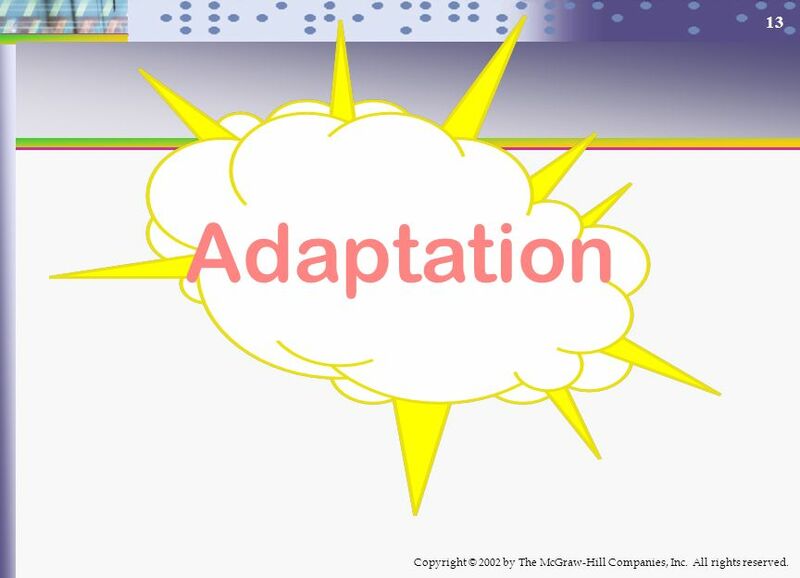 13 Adaptation The slide is useful in emphasizing the point that the complexities of communication require adaptation – a point that will be emphasized in the following sessions. “Writing is thinking on paper. 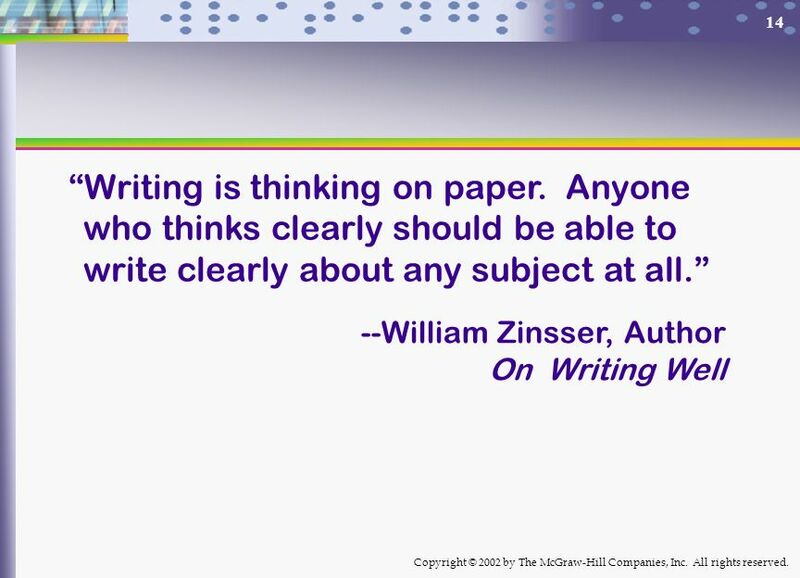 Anyone who thinks clearly should be able to write clearly about any subject at all.” --William Zinsser, Author On Writing Well Use this quote as a final thought – one that will be emphasized throughout the course. Download ppt "Communication in the Workplace"
1 The Individual Knowledge & Experience Check List = World Class Performance Critical Success Steps The Executive Systems, Processes, & Fundamentals The. © 2008 The McGraw-Hill Companies, Inc. All rights reserved 6 - 2ChapterChapter McGraw-Hill/Irwin Organizational Structure and Communication 6. Managing Processes and Capabilities CHAPTER THREE McGraw-Hill/Irwin Copyright © 2011 by the McGraw-Hill Companies, Inc. All rights reserved. 10-1 McGraw-Hill/Irwin © 2002 The McGraw-Hill Companies, Inc., All Rights Reserved. 1 Chapter 58 - Clinical Syndromes of Metabolic Alkalosis Copyright © 2013 Elsevier Inc. All rights reserved. Copyright © 2011, Elsevier Inc. All rights reserved. Chapter 7 Author: Julia Richards and R. Scott Hawley. 1 Chapter 43 - The Urine Concentrating Mechanism and Urea Transporters Copyright © 2013 Elsevier Inc. All rights reserved.